I look forward to the Bay Area Printers’ Fair & Wayzgoose every year for all the amazing art and people I get to meet, not to mention the “new” stuff I get to add to my shop. (I try to consolidate my purchases for the year at this event because of the great variety of things I can find.) Getting the Fair up and running this year was a little more challenging due to the rain. But it made for a more intimate gathering and didn’t dampen the spirits of both visitors and exhibitors alike, who seemed to be having a great time throughout. I usually start out at John Barrett’s Letterpress Things booth. He always brings an amazing selection of wood type and cuts in addition to basic press supplies like gauges, type rulers and galley magnets. This year he had a 4L (~2/3 in) wide star border with all 4 corners. Score! I notice I’ve been drawn to stars lately, so this was an excellent find for me. In addition, I got some cowboy cuts just for fun. I’ve been hand inking more so I wanted to look for a good brayer since the ones I have are only so-so. Jayne and Adrian from Ramco Roller Products, who have made wonderful rollers for me in the past, had one for sale! I felt so lucky to be able to pick up this vintage brayer with a newly covered roller. I also like to swing by Crown Flexo’s booth as they have these incredibly detailed photopolymer plate samples on hand to look at. They laser image all of the plates directly, so there is no loss of detail with film. I’ve been looking for some manicules and Sky Shipley from Skyline Type did not disappoint. I ended up getting some animal dingbats for the kids, as well. In addition, Scott Moore from Moore Wood Type sent some wood type ornaments to be sold at the fair. Andrew Cook from Savoir-Faire was there for the first time this year with their excellent papers and inks. They were having a 40% off Fair special, so I couldn’t resist getting some new papers and inks to try out. I always love to stop by Bryan Kring’s booth to see what he’s come up with. He makes these intricate books/art pieces that I can spend forever perusing. Here is Insecta Coleoptera. Alban and Alexei from the Guild of St. Alban Protomartyr showed for the first time this year. They had beautifully printed and hand painted broadsides on display. They use a washington style hand press to create their art pieces. Johanna Shipley (Sky’s wife) had some elegant type-inspired jewelry for sale. Hope Amico from Gutwrench Press and Anna from Pickypockets Press had their thought-provoking collection of post cards, handbound books and greeting cards. Robert Stow from Hungry Ronin Press and Dean Drumheller from Tunitas Press came down from Half Moon Bay with their handmade wares featuring linocut greeting cards and handbound books and journals. Even SJSU got in on the action, as the student-run SJSU Printmaking Club, headed by Kathy Kong, brought their silk screen and linoleum prints to the Fair. Robert Perry of Dutch Poet Press brought some cubes that were created in collaboration with a photographer friend. Moody images combined with haunting poetry to create a portable work of art. Lisa Rappoport of Littoral Press collaborates with poets and illustrators to create beautiful limited edition broadsides. In addition, it’s always enjoyable to see what new hand bound book or book object she’s created. Eleanor Murray has the most wonderful collection of paper ephemera I have ever seen. There are pages from old bookkeeping ledgers with fine, spidery script, loose pages from Japanese students’ practice books and European maps written in German. All are reasonably priced, just waiting to be part of an art piece. And if you are looking for found objects, Viviane Schupbach has wonderful items for sale, in addition to her hand bound books and artwork. Last year I found very cool brass letter stencils. I am really proud of the variety of demonstrations the Fair has every year. (Full disclosure, I am the person in charge of bringing in the demos.) This year was rather hectic, so I didn’t get to see many, but I did get to see what my girls brought back at the end of the day. 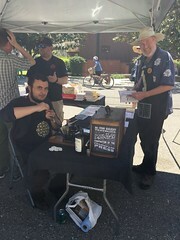 Matt Kelsey of the San Jose Printers Guild outdid himself this year with his design. 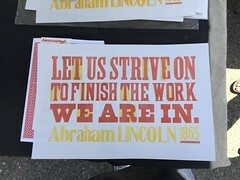 The two color poster, with a quote from Shakespeare in vintage wood type, had smaller outlined type between the lines. The effect was very cool! 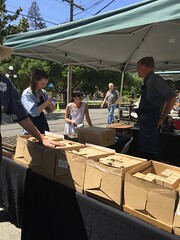 Jim Gard, chair for the San Jose Printers Guild, headed the demonstration for the letterpress books that members of the Guild publish every year. Visitors could personalize their books by printing their name on the bookplate at the front of the book. Volunteers Becky Barber and Carole Dwinell from BABA (Bay Area Book Artists) were on hand to show visitors how to make mini booklets from a single sheet of paper. Visitors walked away with a teeny zine on making a pizza. 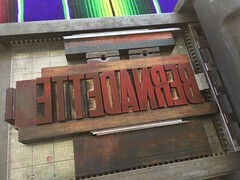 Dave Robison from Ink in Tubes brought his rare multigraph press and demonstrated how to place the special type on its curved surface. Mark Knudsen and Lesya Westerman from the Book Club of California displayed some of the high quality printing they do. Our very own School of Visual Philosophy, who silk screened our Fair shirts, was there to talk about their classes. Representatives from the Tech Shop in San Jose provided a fun demonstration of their laser engraving machine, printing wooden book covers with the SJ Guild’s famous “Printer Guy.” Ivan Gulkov from Pillowface Press brought in his miniature tramp press and Dime Museum to the delight of my girls. Linda Stinchfield of Turtlesilk Press did a book stitching demo. Visitors were able to use preprinted covers, print their title page, and ended up with a very charming little notebook as a keepsake. Maria Ayala of Wikiup Press brought her 4 tabletop presses. After printing a card successively in each press, visitors ended up with a cute 4 color alphabet postcard. She also demonstrated her beautiful calligraphy skills. Peter and Donna Thomas, who also have amazing artist books and ukulele books, and Jillian Bruschera from the Mobile Mill were there. Both provided two unique demonstrations of the papermaking process. The girls were able to bring home paper made in Florida and New Orleans at the end of the day. It was a very busy and full day. I came home tired, but with tons of treasure and good memories. And we get to do it all again next year! Tin Dog Press (aka Bernadette Milan) is a member of the San Jose Printers Guild. She can be found printing on her 1930’s Kluge platen style press.